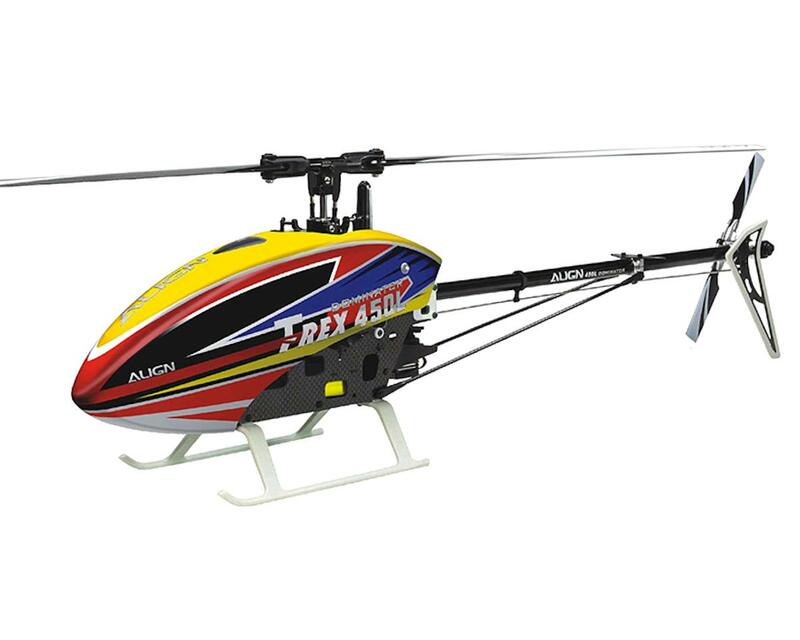 This is the Align T-REX 450LP "ARTF" Electric Helicopter. Pilots looking for an excellent quality and ready-to-go package in a 450 class helicopter, look no further. In a matter of about 20-30 minutes you can be up in the air with the T-Rex 450LP. Built on the successful 450L platform, the LP is an strong and proven design with incredible presence in the sky allowing for excellent visuals and stable and steady flight. As pilots progress in skill, the 450LP is both capable and upgradeable, allowing for an even longer timespan of ownership. Packaged with the 450LP is the Align A10 2.4Ghz Radio Controller, which sports 10 channes, helicopter, airplane, and drone programming, all in a compact and lightweight design. The 2.4GHz module utilizes automatic frequency hopping digital system (AFHDS), offering robust signal strength even at extreme distances. Programming the radio is a breeze thanks to the scroll wheel found on the right side of the radio. Up to 20 models can be stored on the A10 radio system. The electronics package is no different than found in the higher end 450 Align Kits. Align 460MX Brushless Motor, BL45P ESC, DS450 Cyclic Servos, & a DS455 Tail Servo are outfitted providing the pilot with consistent day to day reliability that is critical when learning to fly, or just taking a break through the day and enjoying helicopter flight. The 3s Battery is mounted to a tray which is a quick and easy way to swap packs out to ensure that you are focusing on flying, and not strapping down batteries to a frame or a tray wasting precious time. The Align Mini GRS Flybarless Gyro System offers a simplistic approach to flybarless gyros, and is directly compatible with the Align A10 radio system. This gyro can be utilized in the T-Rex 250, 450, 470, and 500 models, allowing for flexible use of the Gyro in the future if the pilot so chooses. Additionally, this gyro system supports Futaba S-FHSS with built-in capabilities, as well as an ANT port for Spektrum DSM X Sattelites. NOTE: This helicopter is described as "ARTF" because the tail boom and tail belt assembly is not installed on the model from the factory. This process is outlined in the manual and should only take about 15 minutes to complete. Other than this, the model includes EVERYTHING in the box to fly, with the exception of "AA" batteries for the radio. Equipped with the DFC flybarless head assembly, with extremely low CG design to minimize wind resistance while providing more direct control feel. In addition, the main rotor head block and spindle design have been incorporated as standard feature. Carbon side frame plates utilized composite material integration technology, featuring integrated battery mounting rails. The clever use of open spaces within the frame resulting in a structure that is both rigid and aesthetically pleasing. In addition, the T-Rex 450LP cleverly expands on the core concepts of T-Rex 450 Pro designs, to carry on the heritage of its mature design of excellence. Designed with direct servo CCPM control, and a single piece main bearing block with integrated servo mounts similar to that of T-Rex 700E DFC, for simplified servo installation and clean aesthetics. Included 460MX (3200KV) motor is tailor made 3S voltage and the T-Rex 450LP, featuring superior efficiency, high power output, extreme torque, and low current, low temperature. Includes RCE-BL45P electronic speed controller,capable of 2S-6S lipos, with switching BEC featuring variable voltage adjustment between 5V-8.4V. Battery mounting plate with battery latching design, along with integrated mounting rails in side frames to simplify battery installs while protecting them. Swash anti-rotation guide with embedded anti-wear material, effectively minimize the wear between swashplate long ball and guide. Tail is made from competitive material using special embedded carbon technology for enhanced structural strength and excellent visibility. Tail blade grips with thrust bearing design, dramatically increase rudder precision and tail locking effectiveness, while increasing the longevity of bearings. Dual point supported tail control assembly for slop free tail, improving rudder resolution and control precision.